"After getting our bread machine, we were searching for our perfect daily loaf of bread. After some experimenting we found it! This blend of flours gave us a light, sweet bread perfect for soft sandwiches, toast, or just eating straight out of the pan." Place warm water, milk, oil, honey, salt, oats, oat flour, wheat flour, baking flour, and yeast in the pan of a bread machine in the order listed. Set cycle for light crust according to manufacturer's instructions. Was quite disappointed with the final result. The flavor was overwhelmingly heavy wheat with both a dry and gummy texture. Couldn't taste the oat or the honey. I set machine to whole wheat setting, light crust and 2 lb loaf. I also sub coconut oil instead of vegetable. This bread is a hit every time. Delicious! Very delicious! Used oat bran rather than wheat flour. Very moist and tasty. Thank you! I made this the other day for the first time and it was excellent. Will make it regularly from now on. 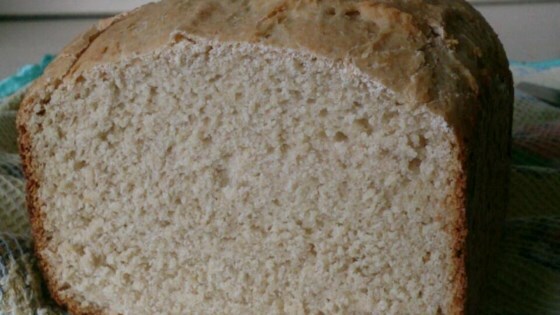 I have made many different breads in my bread maker and this was one of the best.